Forsythia Bush – Bright Yellow Spring Flowers! The forsythia bush is a deciduous shrub with bright yellow flowers that grow in spring before the foliage is growing. It is quite a frugal plant that is easy to grow and to care for. It is native to eastern Asia and southern Europe but is broadly cultivated and a number of varieties have been bred. 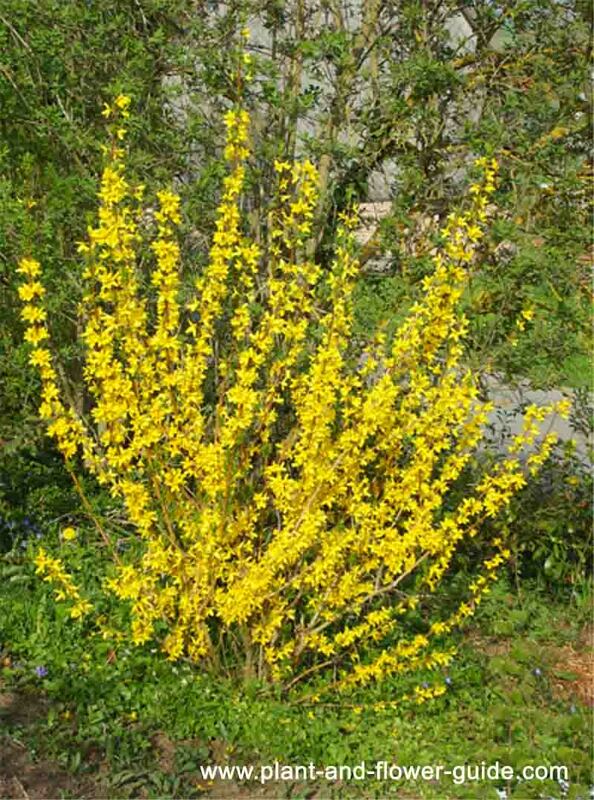 A forsythia bush is a very robust plant that can be planted any time of the year. Yet, it is best to plant it in fall. It will then bloom the coming spring. The plants like to grow in the full sun or in light shady places but tolerate half-shade as well. They prefer well drained and clayey soils that are not too chalky with a pH range from slightly alkaline to somewhat acidic: 6.8 - 7.7. Clayey soils have an excellent mineral content and are therefore very fertile for some plants. They are resistant to the winter cold. If you like to grow a forsythia hedge, then it is best to leave a distance of about 50 to 60 cm between individual bushes. It is best to prune the plants immediately after flowering. Pruning thins the plant out and keeps it compact! Cut the several-year old branches and the thin newly grown branches just above the ground. But do not cut the stronger shoots from last year because these shoots will grow lateral branches in summer. And these lateral branches will then bloom the next year in spring again. Somewhat larger cut surfaces from big branches should be treated with a wound dressing. Otherwise the plant might loose too much sap, which is produced readily after blooming needed to grow healthy and strong foliage. It is best not to prune the plants at all if you have missed the best time to do so. Plants that were trimmed too late will rarely bloom or not bloom at all the upcoming year. Propagating a forsythia bush is simple. Cut cuttings (20 cm in length) from tip growth in spring and summer while the plant still has its foliage. Put them in soil filled garden pots and keep them well drained. Only leave about 5 cm be exposed. As soon as the cuttings have developed good and strong roots you can transplant them in your preferred garden places.